I hesitated between updating the previous post directly or posting a new post. I finally decided to make it a new post so that it’s not too long to read. I will only develop on new stuff here. I have also added a couple of features to the form. I followed Brendan Cassidy’s example and deleted the maximise/minimise and resize options. 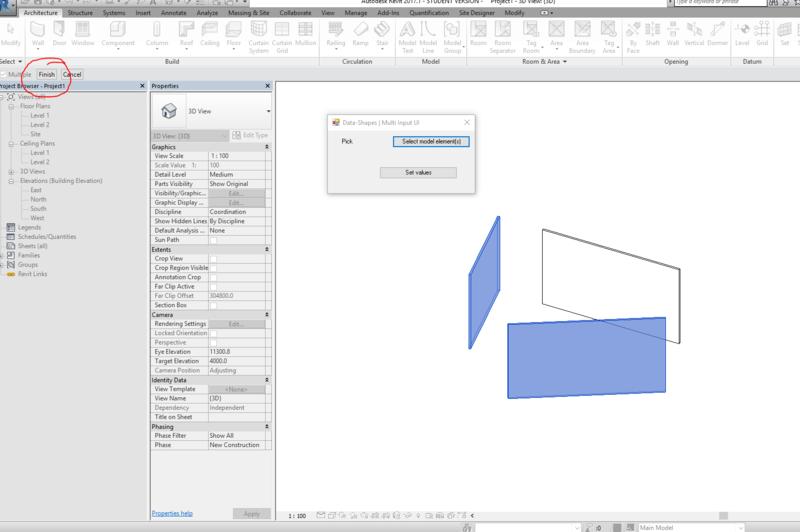 I also set the form so that it would always be in the forefront, this way it will never be hidden which could prevent Dynamo and Revit from working. This node should make it a little easier for those allergic to Dynamo to benefit from its power! – The latest version (13-11-2016) doesn’t allow multi inputs. the older versions do. – The dropdown list doesn’t seem to work at the moment either. Hi Marlo, Thank you for the feedback. I just ran a test and it turns out the issue comes from the way the python node is wrapped in the custom node. Thanks for pointing this one out! Please update the package to the vesrion 2016.11.15 ans let me know if it’s working fine for you. I’ve tried it, and it works as a charm now. Also i’ve been looking at the code and i noticed it’s not possible to fill in a default value. Will this be possible in the future? Recently i’ve been working on several Revit Add-Ins, and if you’d like i can test your new versions and maybe also add some idea’s to add new functionality. allowing a default input value would indeed be a good idea. I was trying to keep the inputs to the minimum, in order to keep is as simple as possible. I have been thinking about making another node with more inputs, like default values and styling options. I will definitely keep you posted when it’s ready ! Amazing. That’s simply amazing. Thanks for this handy tool. I will give it a try. I’m glad you find it useful. Is that an error you get whith version 1.2.1 ? I just tried all input types with that version and it seems to work. Terrifically useful node – thanks so much for creating and sharing! If I had the ability I would love to modify to allow multiple selection listboxes for input Alas my coding skills are currently limited to the now archaic Pascal and FORTRAN. Thanks for the feedback Scott! I’ll try and have that in the next release of the package along with some other new features. Stay tuned! Checkout this article : https://data-shapes.net/2016/12/11/batch-add-shared-parameters-from-txt-file-with-ui-multipleinputform/ ! Could you please post a screenshot of your inputs in the github repository ( https://github.com/MostafaElAyoubi/Data-shapes/issues ) or dynamo forum so I can look into it ? Hi solved that problem,but now I am facing another.Droop down menu is not working. I posted it in Dynamo forum.Please see it. Sometimes it doesn’t follow that order. 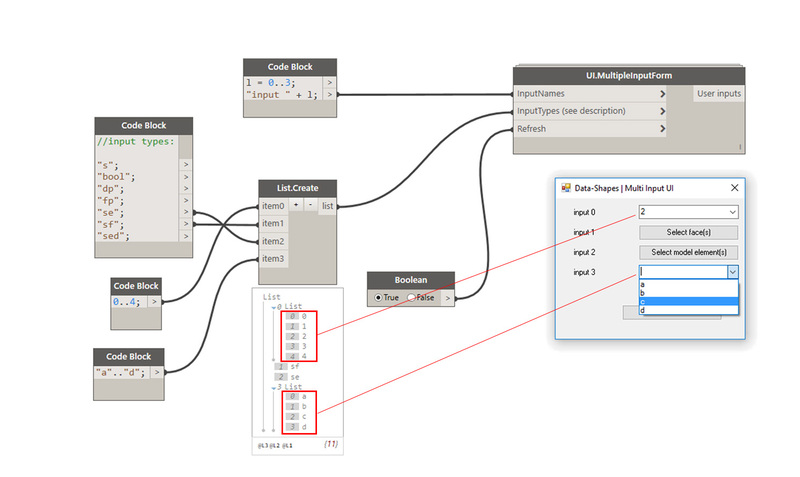 By the way, this is my script that was built form your UI and Archi-lab. I’ve been trying to create and add filter by dynamo with UI input. I’m still perfecting it. What do you mean by “could you add an element selection” ? Yep, it is working fine. In my case, I just want to select an element, pressing finish is a waste of time, and when I forget press finish, it make revit stop working. It would be nice to be able to start excel, do some computations and bring the calculated value or values back as inputs or somethink like that. I like your work, thanks. First off; what a fantastic script! With that set: Is there any way to change the width of both the window/UI menu and the input names? I managed to figure out how to adjust the height (“y”), but can’t seem to find the “x” anywhere. thanks for your message! If you want to modify the width of the label width you need to change the value on line 110 “label.Width = 80” . For the form itself, you’ll need to add a line of code after the initiation of the form (line 85) that would look like this : form.Width = [your value]. That works perfecty! Do you know a site or search I could make in order to find more UI-customizable “settings”? Just for the visual part of the menu. Alot of thanks for the quick response! Thanks for your comment sorry for the very late reply. You’re referring to the “batch add shared paramters script” right? 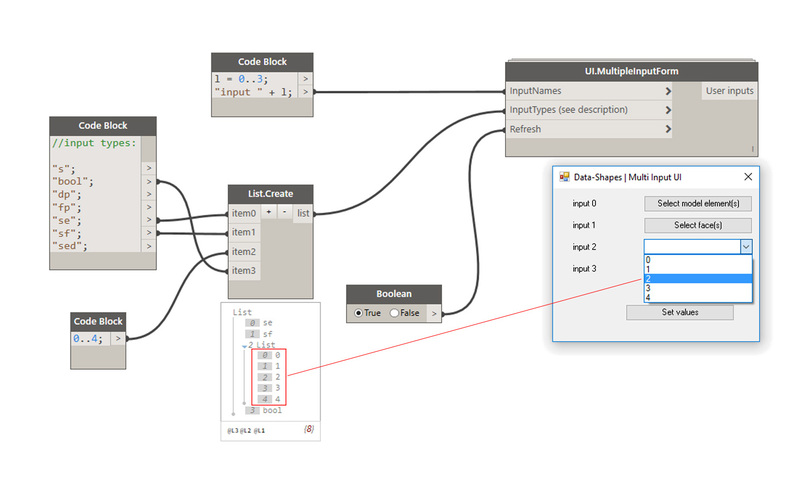 What version of Revit/Dynamo are you using and what category/group are you trying to add the parameters to ? Hi Data Shapes. Good day. First I want to say great stuff you got here. Secondly, I was hoping you could add a feature wherein I can select a face from a link, or it there any existing already, can you assist me help get through this? Thank you very much.